Well, it’s been a while dear readers. 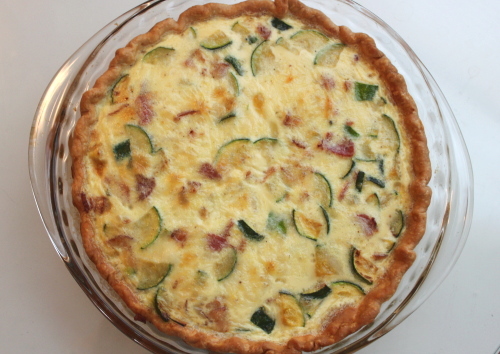 I’m really, truly intending to get back to regular posting and I’m starting off with my favorite quiche recipe. I’ve always loved quiche but didn’t begin to obsess about it until my 20s, living in Bucktown (when it still had a bit of grit to it) mere blocks away from a real French bakery, owned by a young French couple that smoked cigarettes in the shop when customers weren’t around. Their croissants were fresh baked, glazed lightly in marmalade and the quiche–always several varieties–was indescribably delicious. Now on weekend mornings, listening to my household ruckus unfold from the safety of my bed, I sometimes pretend I’m in that tiny quiet Bucktown apartment again. I’m waiting for Reuben to return from his walk to the bakery with a still warm croissant and piece of quiche, a surprise treat that I knew to relish even then. A nice moment to be sure, but I think I prefer my current morning ruckus and quiche warm out of my own oven. Since I rarely have heavy cream in the house, I usually use 1 1/3 cups (320 ml) of whole milk in lieu of the milk and cream mixture. And if you want to skip cleaning another pan, measure your milk in a glass measuring cup and and warm it for a minute or two in your microwave instead of on the stovetop. Put oven rack in middle position and preheat oven to 450°F (230°C). Fit the pie dough into a pie plate and lightly prick all over. Bake according to package instructions, then transfer the crust in pie plate to a rack. Reduce oven temperature to 350°F (180°C). While the crust bakes, cook the bacon in a 12‐inch heavy skillet over moderately high heat, stirring occasionally, until just crisp, about 6 minutes. Transfer the bacon with a slotted spoon to a paper‐towel‐lined plate, reserving the fat in the skillet. Add the zucchini and 1/4 teaspoon salt to the fat in skillet and sauté over moderately high heat, stirring frequently, until zucchini is tender and starting to brown, about 5 minutes, then transfer with slotted spoon to a paper‐towel‐lined plate. Heat the cream, milk, pepper, and remaining 1/4 teaspoon salt in a small saucepan until mixture reaches a bare simmer, then remove from the heat. Whisk together the eggs in a large heatproof bowl, then gradually whisk in the warm cream mixture until combined. Stir in the bacon, zucchini, and cheese and pour into the baked piecrust. Bake until the filling is just set, 25 to 30 minutes. Transfer the quiche in pan to a rack to cool slightly, about 20 minutes. I love eating new foods and try to cook or bake a couple new things each week. People ask a lot about where I get all the new recipes. Usually I take a look in my pantry to see which ingredients are taking up the most shelf space, then check my fridge to see what produce is losing freshness the fastest. I can then search for recipes based on those ingredients. I use the Epicurious website and iPad app quite a bit. It allows me to pull up recipes by ingredients and gives me access to back issues of Gourmet as well as other cooking magazines like Bon Appétit. 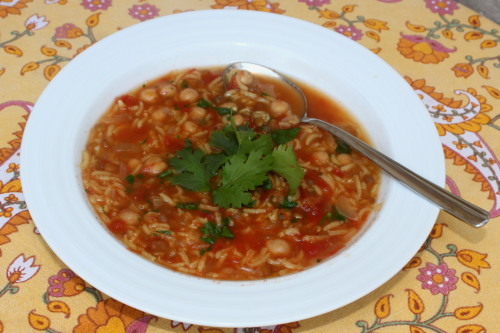 I first discovered this soup recipe when looking for a way to use up huge bags of bulk chickpeas, lentils and rice. The saffron and fresh herbs brighten up these humble ingredients, making it one of my favorite “go to” recipes for winter. I’m always on the lookout for new recipes. Feel free to send your favorites my way. I’d also love to know how you pick out new recipes. The original Gourmet recipe is made with a whole chicken breast, which is simmered than shredded into the soup. I’ve adapted that recipe to make a vegetarian version. Find the chicken‐based recipe here. In a large heavy kettle with a lid bring the broth and water to a boil. Add to the kettle the tomatoes, saffron, onions, chickpeas, rice, and lentils and simmer, covered, 30 minutes, or until the lentils are tender. Season with salt and pepper to taste. Soup may be prepared up to 4 days ahead (cool uncovered before chilling covered). Just before serving, stir in the coriander and parsley. To make about 2 cups cooked chick‐peas begin with a scant cup (180 g) dried. In a bowl soak the chickpeas in water to cover by 2 inches overnight and then drain. In a saucepan combine the drained chickpeas and water to cover by 2 inches and simmer, covered partially, 1 to 1 1/2 hours, or until tender. Drain the chickpeas before using. Last week we celebrated my favorite two food festivities on the same day: Thanksgiving and Hanukkah. This once in a lifetime event (the next occurrence won’t happen for about 70,000 years) was a perfect chance to try a bit of Thanksgivukkah fusion cooking. 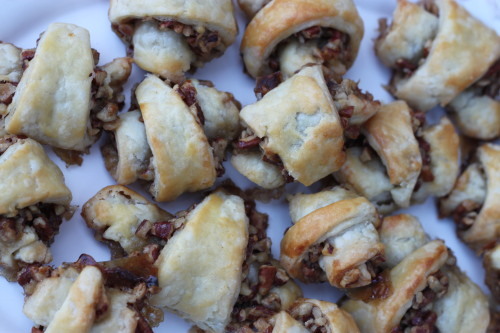 Since I usually make our Thanksgiving dessert, I picked out this pecan pie rugelach recipe weeks ago. These sweet, buttery pastries were well worth the wait. You have a couple days left of Hanukkah to try them for yourself. Speaking of long waits, after 9 months of anticipation, we are especially thankful this year for the arrival of baby boy Benjamin two weeks ago. I’m looking forward to a leisurely holiday season ahead with my new little one, with not much to do except baking and baby snuggling. What could be better! I love that half of this recipe–the dough–can be made the day before baking. If you can spare a half hour, two days in a row, you can whip up these fabulous pastry‐type cookies. Let butter and cream cheese sit out at room temperature for 15 minutes, so that they are still cool but slightly soft. Combine flour and salt in a medium mixing bowl. Using a hand mixer, mix on a low speed just until combined. Scatter butter and cream cheese pieces over the top of the flour mixture, and beat on medium speed until dough is the texture of cottage cheese, still slightly crumbly. Use your hands to divide the dough into 2 equal pieces, then roll each piece into a ball. Flatten each ball into a disk about 1 inch thick and 4 inches in diameter, then wrap each one separately in plastic wrap, and refrigerate at least 2 hours, up to 1 day. Place chopped pecans in a small bowl. In a small saucepan over medium heat, brown the butter by adding all 4 pieces at once and constantly stirring with a heatproof spatula until completely melted. Continue to stir or swirl the pan as butter starts to bubble and foam. When the foam subsides slightly and butter turns a light brown color, take it off the heat immediately and add the it to the chopped pecans. Add vanilla extract, corn syrup, and brown sugar, and mix with a rubber spatula just until combined. Preheat oven to 350°F. Line two cookie sheets with parchment paper. Beat egg yolk with the tablespoon of water and set aside. When the dough is chilled, unwrap one disk onto a lightly floured surface, and roll with a rolling pin into a 12‐inch circle. It is important to have an even, symmetrical circle, so trim any excess. If dough gets too soft during rolling, lay it on one of the lined baking sheets and put it in the freezer for 5 minutes, until slightly chilled. Once the dough is rolled out, sprinkle half of the pecan mixture on top of the dough, all the way to the edges of the circle, making sure the mixture is evenly distributed. With a pizza cutter (or a knife), cut dough into 16 equal slices. Roll each slice from the outside in (starting the wide end and rolling towards the point), placing each roll onto the cookie sheet as you go. Repeat this process with the other disk of dough. Use a pastry brush to coat the top of each cookie with the egg‐water mixture. Bake rugelach for 20 minutes until golden, turning the cookie sheet halfway through baking. Cool completely before serving. Store in a covered (but not airtight) container for up to 3 days. Like all my other pregnancies, this one announced itself with 24/7 nausea and an aversion to nearly all food. Luckily, my second trimester started this week and I am feeling better already. Though not quite ready to eat with abandon, at least I’ve found a few things to get me excited about being in the kitchen, namely rhubarb and ginger. For those not familiar with this leafy perennial, rhubarb stalks look like rose‐hued celery and it’s leaves are large and broad. It really needs to be cooked to be edible and even then, due to its tartness, usually relies on a fair amount of sugar or other sweetener to make it palatable. The house we purchased last fall came with two ancient rhubarb plants, with leaves about the size of an overweight cat. Big! Apparently, the neighbors (the plant borders the alley and our neighbors are free to take as many stalks as they want) tried to transplant part of it a few years ago. After several hours of work they gave up, unable to hack apart the thick old roots holding it, and probably my house’s foundation, in place. Though I still adore the Lemon Buttermilk Rhubarb Cake posted years ago, I’ve been experimenting with other rhubarb recipes. This syrup, combining rhubarb with my anti‐nausea weapon (aka ginger), is delightfully tart yet sweet enough for even the kids to enjoy. Paired with soda water, it is perfect summer refreshment. I’d imagine it might also be fantastic paired with ice cold vodka or a crisp sparkling wine and would love to hear the results if anyone is willing to test these combos out for me. Wash the rhubarb and cut the stalks into one inch pieces. No need to measure, they are going to break down completely. Peel the ginger, but do not be too concerned about getting every bit of peel off. Cut the ginger into slices. You want to maximize the ginger’s surface area for flavor, but do not worry about peel in the final product. Place the rhubarb, ginger, and water in a large non‐reactive pan and bring to a boil. Do not cover. Once the mixture is boiling, reduce heat and simmer 30 minutes or until the rhubarb is very soft and broken down. Let the mixture cool slightly. Pour the mixture into a fine mesh strainer held over a large bowl and let it drain for at least one hour. Measure the drained liquid and pour it into a medium non‐reactive pan. Add half as much sugar as you have liquid. I had 2 cups rhubarb liquid so I added 1 cup of sugar. Heat the liquid and sugar, stirring to dissolve and bring it to a boil. 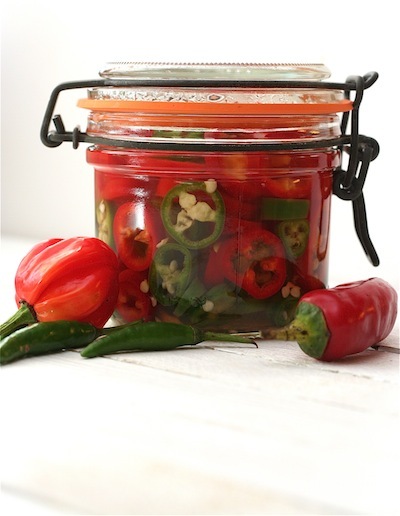 Boil for two minutes and then pour into a clean glass jar (or two). Let cool then store, covered, in the fridge. 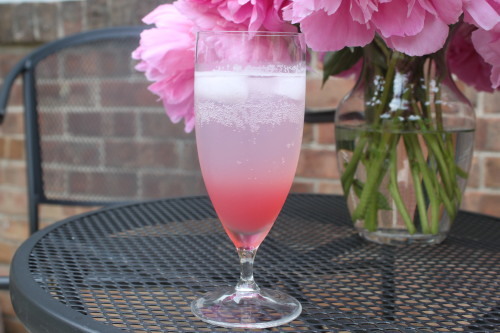 To make spritzer: Mix 1 cup (240 ml) of soda (sparkling) water with 1 to 3 tablespoons of cooled syrup (to taste). Add ice and enjoy. Like Leah, I use white beans that I cook myself instead of canned beans. The Tuscan‐style White Beans post gives some instructions on cooking dried white beans. 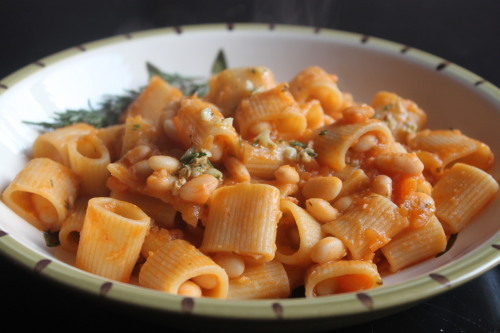 Actually, the cooked Tuscan‐style white beans would taste amazing in this recipe. Pulse the onion, carrot, celery, whole garlic cloves, parsley and red pepper flakes in a food processor until finely chopped. Heat the oil in a large, heavy pot over a medium heat. Add the chopped vegetables and season with salt and pepper. Cook for 8 to 10 minutes, stirring often, until golden (wipe out the food processor bowl while the vegetables are cooking). Stir the tomato paste and 1 cup (250 ml) water in a small bowl to combine, then add to the pot. Scrape up any browned bits from the bottom of the pot and bring to a boil. Reduce the heat and simmer for 5 to 8 minutes, until the liquid has almost evaporated. Add the chickpeas and 2 cups (500 ml) water to the pot and simmer for 15 minutes to let the flavors meld. Transfer 1 cup (250 ml) of the chickpea and vegetable mixture to the food processor. Purée until smooth, then stir back into the sauce to thicken it. Meanwhile, cook the pasta in a large pot of boiling salted water, stirring occasionally, until al dente. Drain the pasta, reserving 1 1/2 cups (375 ml) of the pasta cooking liquid. Add the pasta and 1/2 cup (125 ml) of the pasta cooking liquid to the sauce and stir to coat. Increase the heat to medium and continue stirring, adding more pasta cooking liquid as needed, until the sauce coats all the pasta. To make the garlic‐rosemary oil, heat the oil in a small sauce­pan over a medium‐low heat. Add the chopped garlic and rosemary and cook for about 1 minute, until it stops sizzling. Divide the pasta among bowls and drizzle with the garlic‐rosemary oil. You all know I love make ahead meals (remember this and this and this). And I have a soft spot for casseroles. Well, here’s the recipe that is now both my favorite make ahead meal and my favorite casserole. I’ve kept a batch of this on hand in my freezer continually since I discovered the recipe this fall. It hails from the new What’s for Supper cookbook from Southern Living. While not overly impressed by some of the recipes in the book (too many prepared processed foods for my taste), I knew I would try this recipe for the name alone. Green Bay Packer coach Vince Lombardi holds a special place in the hearts of most Wisconsinites and if the casserole performed even half as well as the coach, it was worth a try. Touchdown! This is an easily adaptable recipe. I usually use more egg noodles than called for and then add an extra tablespoons of cream cheese. Since my daughter is currently green onion adverse, I cut back on those or use only the white parts so she doesn’t notice them as much. Feel free to experiment according to your own tastes. Preheat the oven to 350°F (180°C). Prepare the egg noodles according to package directions. Meanwhile, sprinkle the ground beef with 1 tsp. salt and the Italian seasoning. Cook the beef in a large skillet over medium heat, stirring often, 5 to 6 minutes or until meat crumbles and is no longer pink. Stir in the tomato paste, and cook 2 minutes; stir in the tomatoes, 1/2 cup water, and remaining 1/2 tsp. salt; reduce the heat to medium‐low, and simmer 8–10 minutes until thickened a bit. Microwave the cream cheese in a microwave‐safe bowl at HIGH 20 seconds. Stir in the sour cream and green onions into the warm cream cheese, then gently stir the cream cheese mixture into the hot cooked noodles. Spread the noodle mixture in the bottom of a lightly greased 11‐ x 7‐inch baking dish. Top the noodles with the beef mixture then sprinkle the shredded cheese evenly over the mixture. Bake the casserole at 350° for 25 minutes or until hot and bubbly. 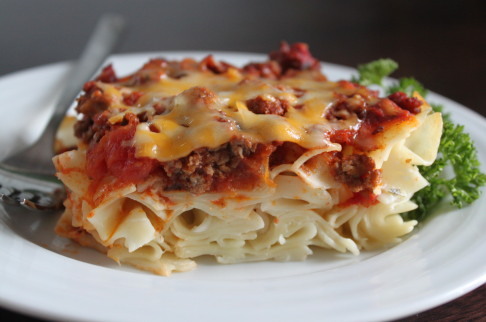 To make ahead: Freeze the unbaked casserole, tightly covered, for up to 1 month. Thaw in the refrigerator overnight, then bake at 350°F (180°C), loosely covered in aluminum foil for 25 minutes. Remove the foil and continue baking about 15 minutes more until the cheese is melted and the casserole is hot. I vowed to post more recipes in 2013 and, like so many other New Year’s resolutions, find myself failing miserably by the end of January. Despite my blog negligence, I have been cooking up a storm. I now realize that the prospect of free time on the weekends thrills me because I know I will have time to spend a few hours on my feet in front of the stove, my desire to stand around and stir pots all afternoon the result of working a desk job, I guess! Though these delicious chicken cakes aren’t the best thing I’ve made this month, they were cooked during our sunniest (most photo friendly) weather. I love the rich umami taste of these succulent little meat cakes and the fact that the homemade teriyaki glaze cooks in the pan along with the chicken, requiring no separate sticky pot to wash later. Though we all enjoyed them, Anabelle scarfed hers down fastest with a nod of approval and an it‐tastes‐like‐sausage compliment. If you know my kids, no bigger praise can they bestow on food. I paired this Japanese inspired dish with a cucumber salad and string beans. A side of rice would also be nice, but don’t expect to have extra sauce to flavor it. The teriyaki “sauce” is really a glaze. These would make awesome appetizers. Mix the ground chicken with the egg, grated onion, sugar and soy sauce until the ingredients are thoroughly combined and well bound, about 2 minutes. The mixture will be quite sticky, which makes for good texture. Shape the mixture into 12 small, flat, round cakes and dust them lightly all over with cornstarch. Since the mixture is very sticky, I found it easiest to coat my fingers in cornstarch then drop the semi‐formed cake into the cornstarch. Once it was covered in cornstarch I was able to properly form it. Soak the white/light green part of the scallions in ice water for 5 minutes and drain well. The ends should curl slightly. Heat the oil in a frying pan. Place the chicken cakes in a single layer, and cook over medium heat for 3 minutes. Turn the cakes over and cook for 3 minutes longer, until cooked through. Mix the ingredients for the sauce and pour it into the pan. Turn the chicken cakes occasionally until they are evenly glazed. Move or gently shake the pan to prevent the sauce from burning. 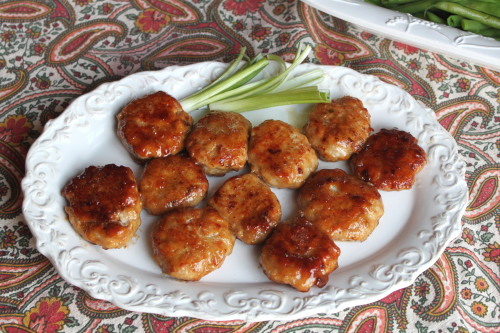 Arrange the chicken cakes on a plate and top with the scallions. Serve immediately.